From the remarkable Ha Jin, winner of the National Book Award for his celebrated novel Waiting, a collection of comical and deeply moving tales of contemporary China that are as warm and human as they are surprising, disturbing, and delightful. In the title story, the head of security at a factory is shocked, first when the hansomest worker on the floor proposes marriage to his homely adopted daughter, and again when his new son-in-law is arrested for the "crime" of homosexuality. In "After Cowboy Chicken Came to Town," the workers at an American-style fast food franchise receive a hilarious crash course in marketing, deep frying, and that frustrating capitalist dictum, "the customer is always right. 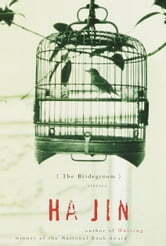 "Ha Jin has triumphed again with his unforgettable storytelling in The Bridegroom.